This year is the first year that we are entering the Irish Times Best Shops in Ireland award 2015 and here is where you dear readers, can help – we would love to have your nomination! 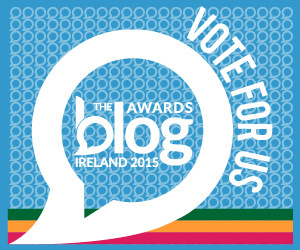 All you have to do is click this link Best Shops in Ireland and fill in the nomination form. Thanks to everyone who nominated us – we were delighted to have our photo featured in the Irish Times Magazine on Saturday 8th of August. 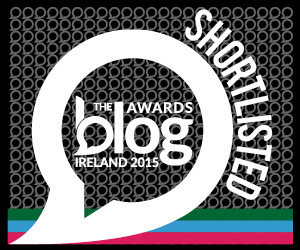 Sadly, we did not make the shortlist but the competition was very stiff – over 3000 entries for a shortlist of just 100. All to play for again next year! 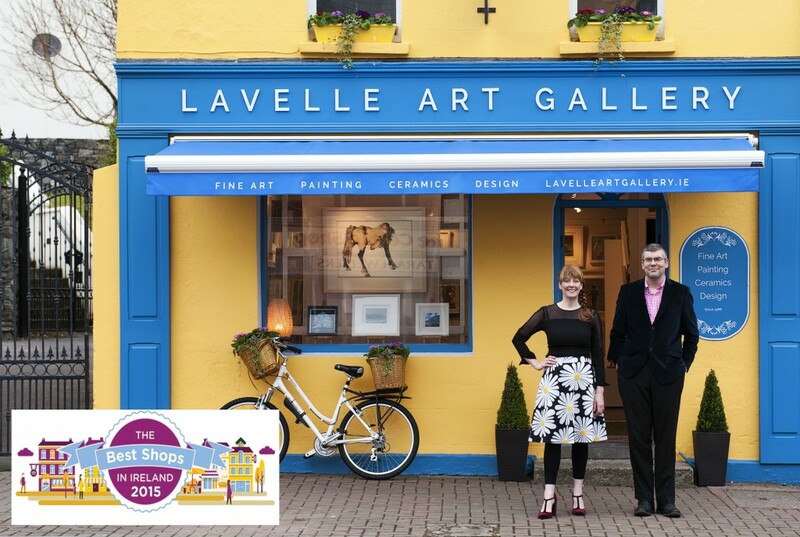 The Lavelle Art Gallery is our family business, run by my husband Gavin Lavelle. This year is the first year that we are entering the Irish Times Best Shops in Ireland award 2015 and this is where you dear readers, can help – we would love to have your nomination! Thanks to everyone who nominated us – we were delighted to have our photo featured in the Irish Times Magazine on Saturday 8th August. Sadly we did not make the short list this year but the competition was very stiff – over 3000 entries for a short list of 100. All to play for again next year. I’ve been busy for the last few weeks, doing lots of writing and not very much painting. I’ve been involved in a poetry workshop for over a year now and it’s been great. Writing has slipped into my life so quietly and unexpectedly that I find myself wondering what I did with my time before the workshops. Possibly more painting but life is always a juggling act – for me it’s a question of balance and trying to find just enough time for everything to keep some kind of equilibrium. At the moment I am writing a business plan for our gallery as we are hoping to develop what we are doing in a new direction. It’s a different kind of writing of course but it is also exciting and I hope that I will be able to share more about that in a few months time. For now I am going to talk about this painting. I came across it recently while sorting through my desk. I remember working on it about six months ago and leaving it aside as I was unsure whether or not it was finished. Clearly some part of me believed it was not, as it lay quietly unnoticed for all this time. When I found it, I wondered why, because it does seem finished to me now! 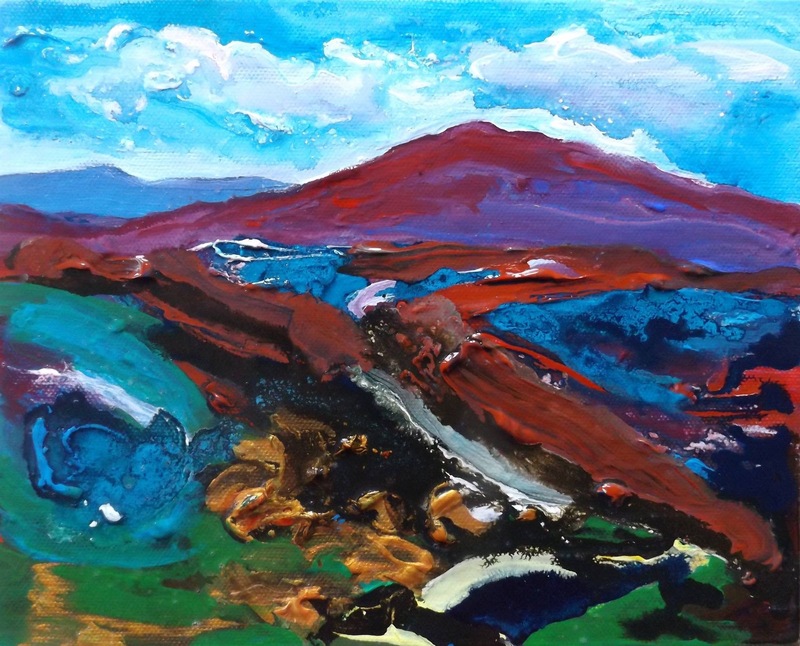 There are blocks of colour on the right – the pink and green that might seem flat and unresolved compared to the more subtly applied colour to the left, but this gives the piece interest and balance which is something easily lost if the whole surface is treated in the same way. The negatives seem outweighed by the positives – there is atmosphere, something moody around that hazy purple, the way the light diffuses in the distance and those stripes of red, pink and green do work even though they are incongruous with the rest of the piece. 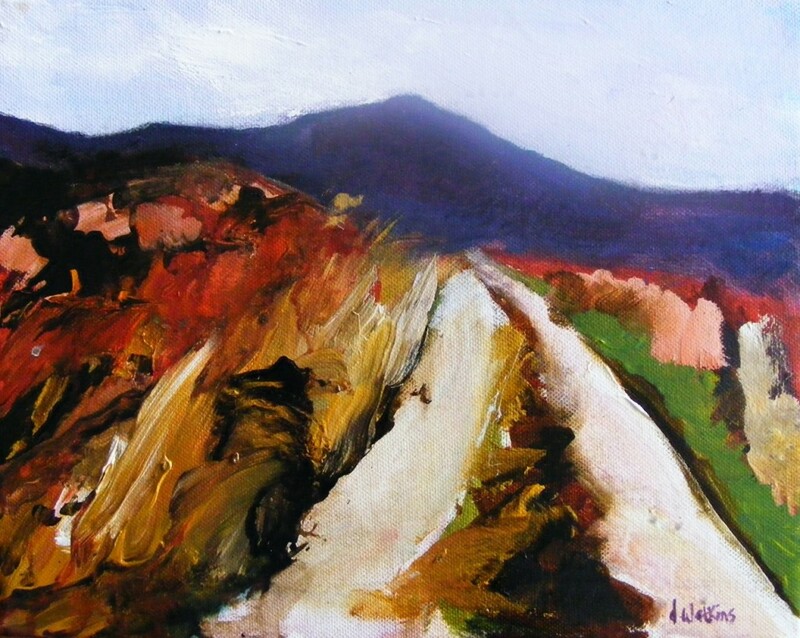 It reminds me how useful and important it is to take some perspective on a painting – a little distance and time have allowed me to see the piece as if for the first time, so it is easier to make a judgement. I realise how true this is of writing and yes, so many other aspects in life – it has just taken six months and an old painting to help me remember. I went on a trip to Brigit’s Garden recently with my family. This is a not-for-profit organisation and a registered charity set up by Jenny Beale out of her passion for nature and the environment. 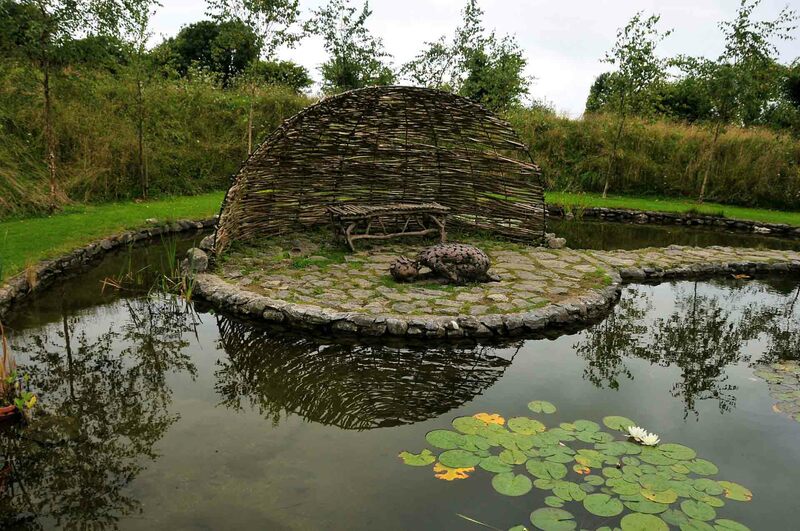 The gardens were designed by Irish landscape designer Mary Reynolds who was the first Irish person to win a gold medal at the prestigious Chelsea flower show and is arguably one of the best designers in the country. 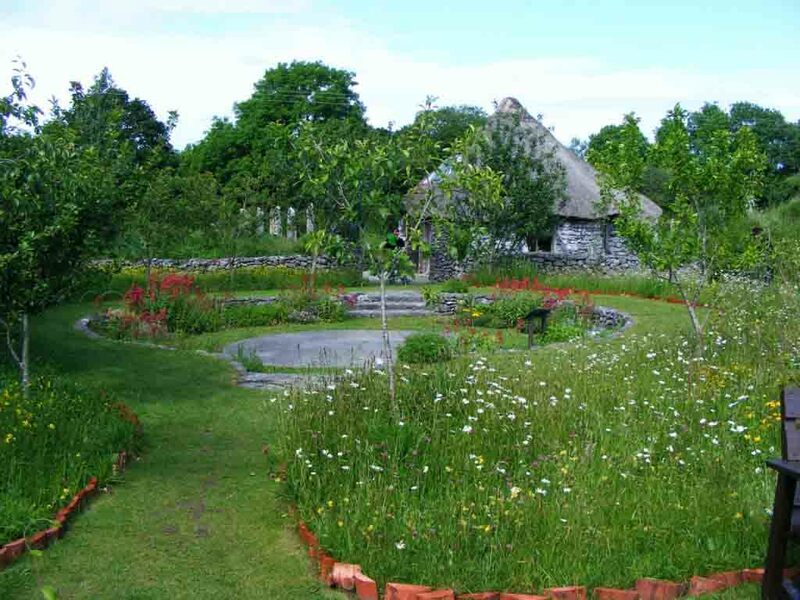 The gardens are located in Rosscahil which is just a few miles outside Galway city. 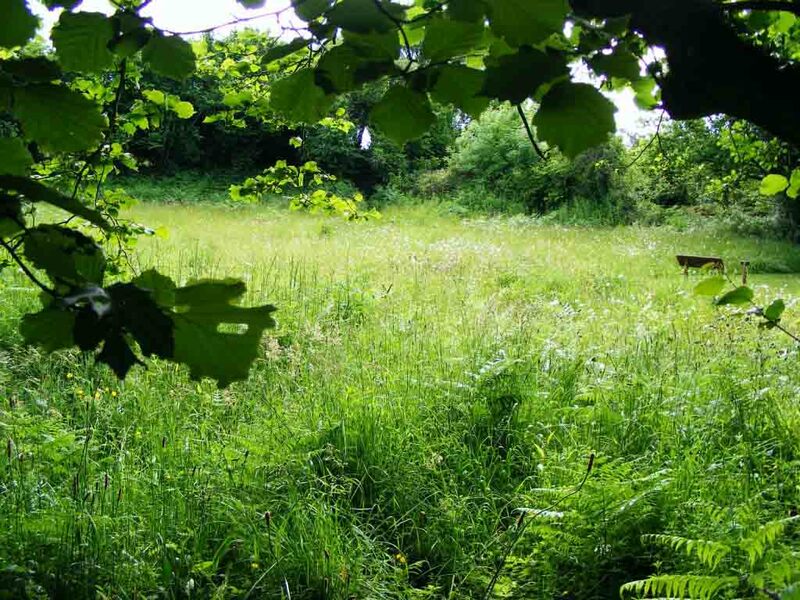 They are set within an 11 acre site of native woodland and wildflower meadows and they celebrate our natural landscape in a design based on the four Irish seasons. These four gardens interconnect and take us on a journey through the Irish seasonal festivals of Samhain, Imbolc, Bealtaine and Lughnasa. The gardens mirror the cycle of life from conception and birth through to old age and death. Samhain ( Halloween ) begins on the 31st of October and marks the beginning of the yearly cycle. It is celebrated here in the winter garden (below) which pays homage to a time for death but with the promise of re-birth. It is a period of sleep and reflection which is evoked by a mound of earth that has been shaped into the sleeping body of a woman wrapped around a pool. 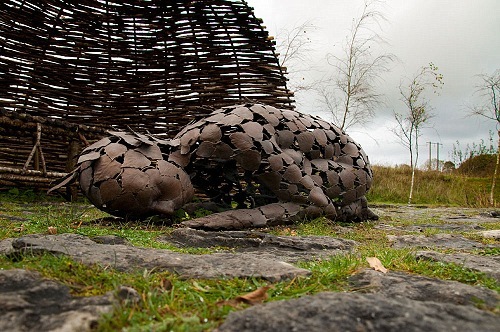 Another figure made of bronze leaves rests on the ground in an island within the pool. She is listening to the earth, waiting for it to stir again and bring forth new life. Imbolc is the Spring garden. This is the old Irish name for the festival that welcomes the arrival of Spring on February 1st, now known as St. Brigit’s Day. 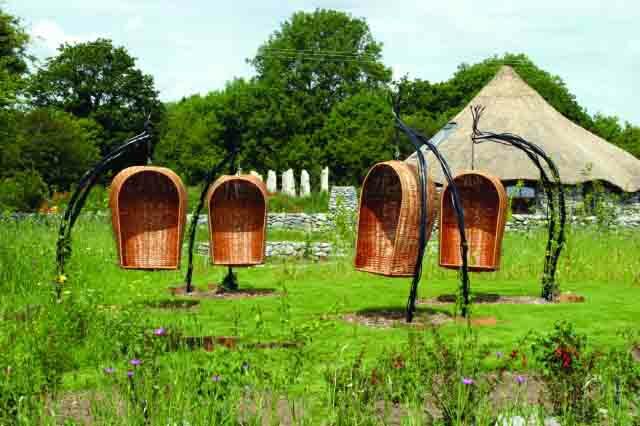 In the cycle of life, it is the garden of youth where children can play and enjoy the basketwork swings and a wildflower meadow. Here’s one of my photos of the Spring Garden (below) with wild flowers in full bloom. 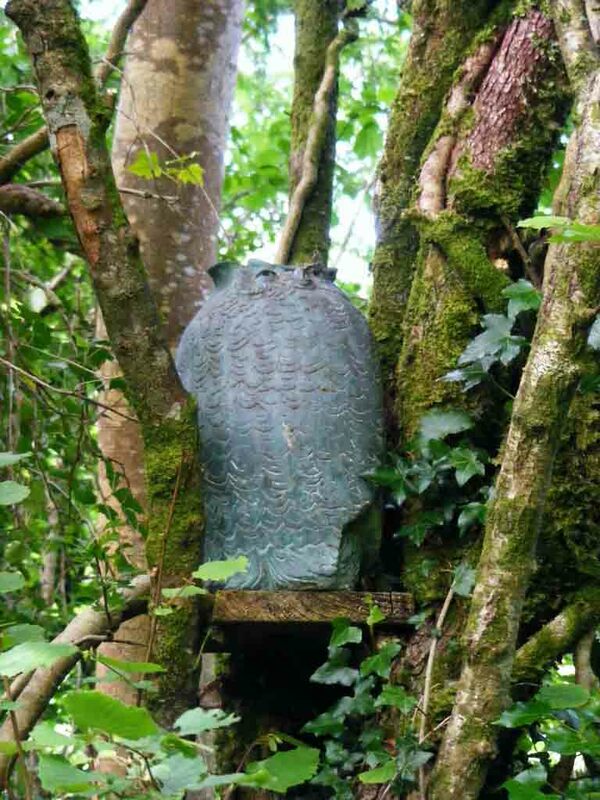 May day heralds the festival of Bealtaine which is celebrated in the Summer Garden. This is a time of young adulthood, sexual awakenings and marriage. 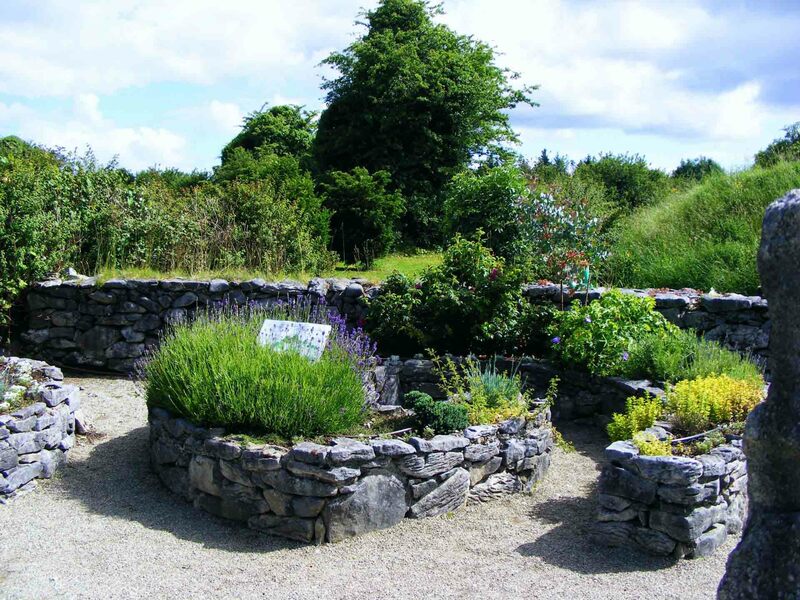 The garden tells the story of Diarmuid and Grainne, the fleeing lovers in Irish mythology. 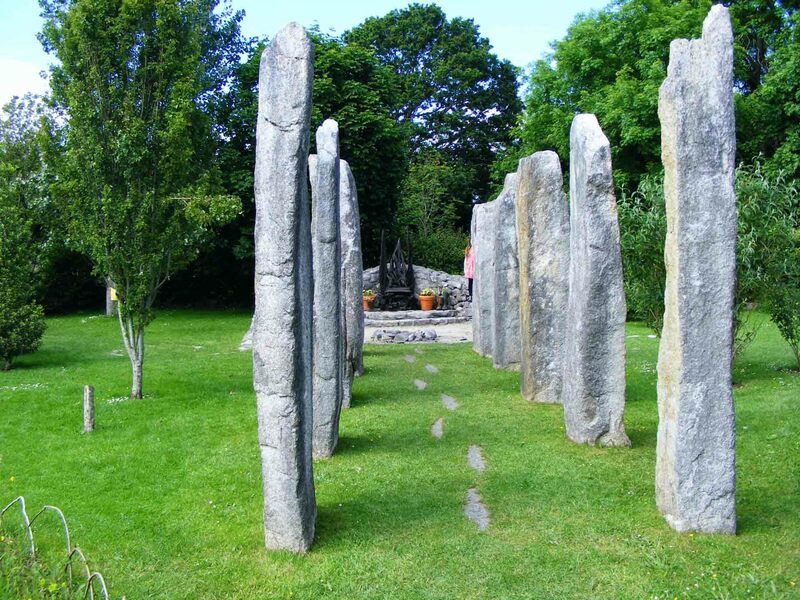 Their bed is a grassy hollow facing the sun and a path of standing stones leads to a throne where the lovers unite and sit together, masters of their own destinies. The Autumn garden marks the festival of Lughnasa which begins in August. It is a time of harvest and celebration. Spiral beds contain herbs for cooking as well as healing (below). 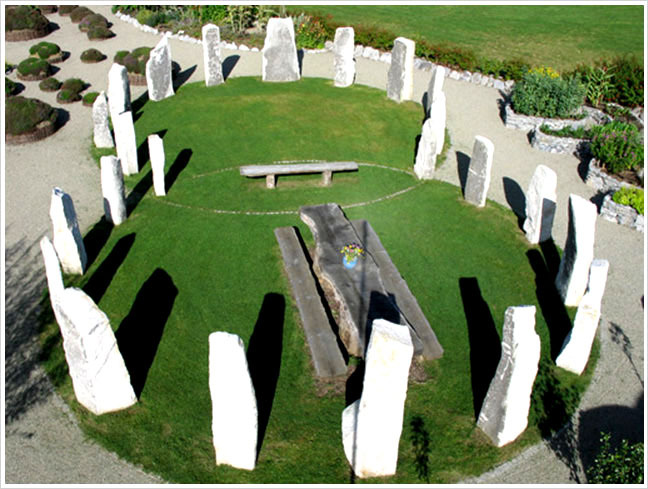 Two circular lawns interlink and are circled by columns of stone to allow space for dancing. There is a long table for feasting and celebration. Three yew trees mark the exit of the Lughnasa Garden which signifies the end of the cycle and the possibility of renewal which lies ahead. There is much more to see and enjoy here as well as the four symbolic gardens. 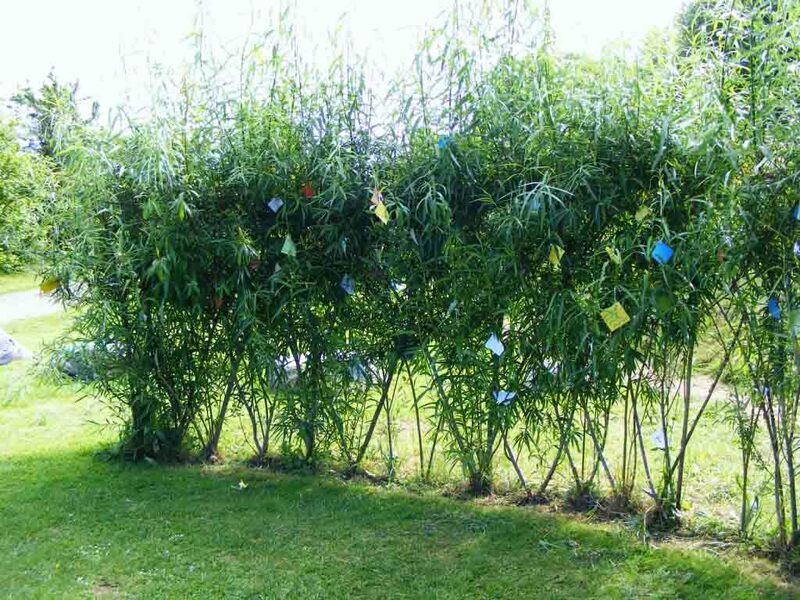 There’s a giant sun dial, a woodland walk, a living willow play area for children and a place to hang wishes (photo below). This is a view of one of the wildflower meadows from the woodland walk (below). I spotted this owl in a tree (below) which I hadn’t noticed on previous visits. The unexpected is part of the magic of this place..
You can round off your visit as we did in the cafe which offers delicious home baked cakes! I’ll be going along again soon and I’d recommend it to anyone, especially at this time of year when the wildflowers are in full bloom.